Jeremy just got this VIDEO of American Craftsman Bungalow style home Historic Perryville, KY. Call for more info and a site visit to see the town and this property. call or text Ken 859-494-5521 Bluegrass Team You will want to get you in our Exclusive Mailing List, so we can send you your PERFECT homes and land – and farms the second they are for sale (not when they hit the MLS). go to “Your Perfect Property” at https://bluegrassteam.com/homefinder/ – it only takes a few seconds to fill out your needs and wants and we will start sending you properties that meet YOUR criteria. You’ll be 1st to know about properties – It’s like a sneak peek – before they hit the market – sent right to your inbox. American Foursquare, Cottage Home, Historic Homes, Perryville KY, VIDEO of American Craftsman Bungalow style home Historic Perryville, KY, American Foursquare, Cottage Home, Historic Homes For Sale, VIDEO of Historic Homes. Today I’ve got a American Craftsman Bungalow style house for you in Perryville, first I want to show you the location. First off, look at the neighbors here, you got flags, you’ve got more flags, when I used to be a photographer for a magazine, we said…always said if someone has a flag outside it’s usually a pretty nice house, and it’s always true a lot of times. Look how interesting that house is, that house, look how interesting this place is, and this is the subject house, I’m going to show you in a minute, and this is what I want to show you, here you’re a block and a half from State Highway-150. So you go up here…first of all, post office’s right there, see that grey car is, see it right there, and that’s the post office. What’s next to the post office? A bank of course, what’s across the street? Another bank, there’s two convenience stores in town. Great little town, it’s nothing much, it’s a little historic town, it’s got a couple antique shops, doesn’t have much more than that, but it’s great cause it’s nice to live nowhere sometimes, you know you just want to get away from it. 150, make a right, eight and a half miles, you’re in Danville, college town; left, you can go all the way to Bardstown and Louisville and everything, it’s really nice. So Perryville isn’t big, it’s about four blocks on this side and about three blocks on the other side of the highway, and you’ve got the historic district, and you’ve got this craftsman-style house. For those of you who know, craftsman-style is 1920s-ish, somewhere around there, this could be a little older, or whatever, and it might not be a hundred percent craftsman-style, I’m not a student of architecture, you may be; and if you are, please put it in the comments down below. 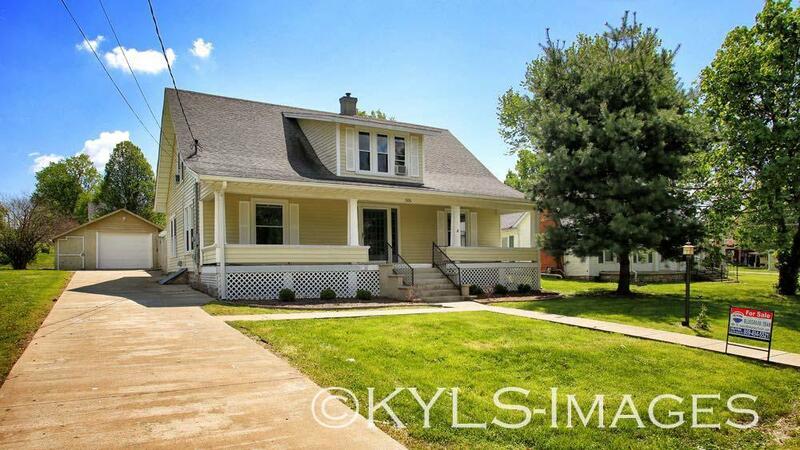 This is a four-bedroom Craftsman Bungalow style house. So what do we always get asked for? We either get asked for small farms for gentlemen farmers, or asked for a single-family home with four bedrooms. This one’s got four bedrooms, it’s got a really nice backyard; it’s got a pool that needs to be taken out, which the owners are willing to do for you…for a new buyer, may even be done by the time you get here. So…but anyway you’ve got a nice big yard, private, and you can turn it in anything you want, or put another pool in. Anyway I know a lot of folks who live in this neighborhood, I know a lot of people who live in this neighborhood, it’s all nice decent folks, and it’s close to everything, and that’s why people like to live in Perryville. Oh, and one more thing, if you got kiddos, really good school system, the Boyle County School System, you can look at School Report Card online, or any of those websites and you can see, it’s a very desirable school system and you’re in it, right here. Okay, come on let’s go inside. So first of all, the people just moved so not everything is a hundred and 10 percent out; you’ve wainscoting on the ceiling; you’ve got the old-style bards that go this way, remember everybody’s grandmother had one that was painted battleship gray…that real slick paint. Look how big this porch is, it’s nice, it’s at least six-feet wide this way, but here’s the interesting thing, lots of beveled glass and four-foot wide doors, every door is like four-feet wide, it’s crazy. Let’s just go on inside and see what’s going on. The house of many doors. So I tell you the good, the bad and the ugly right? Where do you see doors, four-foot wide doors, and so many of them? And then you’ve got this mirror stuff on the wall…have no idea, don’t ask, I won’t tell, but it’s just thin pieces of mirror and these can just pop right off and you can go back to a regular wall, and it’s just on these two walls anyways, it’s no big deal. I want to tell you all the stuff, that way you can kind of preview the houses yourself before you take the drive to come out and see us. I like this house, the woodwork, all from natural woodwork, very cool, if you don’t like it, paint it, but if you want…if you’re …resting, you want this wood showing, then you’re not going to want to paint it, that’s for sure. All oak floors, and here you got this like herring-bone thing going on, not really herring bone but look at that, I don’t know what they call that, but that’s pretty cool. Dining room, you know I’m king of dining rooms, I love dining rooms, and again, two four-foot wide doors…they’re huge! Can you imagine a nice arc deck or craftsman chandelier there. The kitchen’s right off here to the right, I’m going to show you in here first. So you’ve got this seating room, you’ve got a living room there, seating room there, leave the doors open you’ve got one big room. Got a big closet there…fireplace, gas fireplace, yes it has city gas, and yes it has KU electric, KU electric is something you want. The rural electric is still reasonable around here but KU electric is almost half price. I’ll show you a little bit outside. So everybody wants this KU electric stuff. This goes down to very short crawl, if you’re three foot six, it’s plenty of room downstairs for a basement, if you’re more than three foot six…I was bent over, I wasn’t clunking my head but I was bent over pretty good, it’s a small crawl. Oh, let me show you this, maybe it’s four feet, I’m just exaggerating whatever it is, it’s a short crawl but it’s got new electric cards, it’s got the…I think it’s 200-amps, huge breaker box, with all the new breakers. Here’s a full bathroom…big closet, and then we’ll go on to the kitchen. See all that just plain woodwork, you’ve got the old shellac on it, years and years of stuff, so if you like that, you’re going to love it because it’s not been touched, and again, if you want go for a more modern look, paint it white, you can rock and roll. But decent kitchen, nice and neat in size, and let’s go right to the… out to the den. Okay, so I mentioned to you four bedrooms, you want…everybody wants four bedrooms, well this has got a master on main, so there’s three out there. Got the laundry room and half bath…closet, I don’t know if I wouldn’t try to install a shower in there, wouldn’t that be great, then you’d have three baths right. So here’s the master bedroom, nice big closet, remember for the price point, this house is really quite a deal. And then you’ve got these patio doors which you could put tanning booth out here, hot tub, you could do a sauna, it’s got heavy power, there’s a big heavy power deal out there and a door out there, a changing room maybe for the pool. See the pool area, the pool’s gone, pool’s dead, we’re going to do something about that, but nice nice yard. And then you’ve got the little garage cabana thing there. So possibilities are endless here in this little room. What would you do with it? Okay back to the kitchen, we’re going to go upstairs and I’m going to show the three bedrooms and the landing up there, which is huge. Again, all the woodwork is still intact, pretty nice. Typical old house, regular height ceilings here, really high ceilings downstairs. So there’s a full bath here, and it’s got these new topian windows, they’re not brand new but they’re really nice. Here’s a good sign here, a good omen, even the robins want to have a home here, you got two robins, or three robin’s eggs there. It’s Springtime in Kentucky. Smaller bedroom, and then these two really big bedrooms, I mean they’re really nice size, 12 by 14, or 13 by 15, or something like that. Could you see yourself here? All the little roads in Perryville, the kids can ride bikes out there, it’s not too far to the school, there’s a Dollar General here, and that’s kind of nice now. If you’re not familiar with Dollar General, it’s like a micro Walmart, they actually have more stores than Walmart does worldwide; Walmart’s worldwide, Dollar General only has stores in the United States, they have more stores, so it’s like a micro Walmart, and they’re open seven days a week from like 8:00 in the morning til 9:00 at night generally, something like that. So again, there’s the pool, just imagine that, either another pool or this yard all into garden and what not. American Craftsman Bungalow style home Historic Perryville, KY This is the little garage, you know in my opinion, I’m just being straight up with you, if you were my brother or sister I would tell you the same thing, this is not big enough for a regular garage to today’s standards, why don’t you turn this into a little like guest house, or a little changing room, or a little potting shed or something, a pouting house? This is a doll, I would love to get my hands on this, it’s got a tin roof and choose a button, you just never know what people are going to do…just trying to give some ideas, and I get some ideas from you too, just put them down here in the comments. You know the drill, if you’ve been watching any of your videos, we always tell you “Get on our mailing list, or get our newsletter.” The link is right here, just click on it and go to our website, fill out what you need, what’s your ideal property looks like and we’ll start sending you emails about properties before they go on the MLS, before they go to the public, that way you’ll know about properties before anyone else does, just like this one, this goes out to our list first a few days ahead and then it goes out to the public. Wouldn’t you like first crack at this? Location, location. This is it, thanks for watching, really appreciate it.